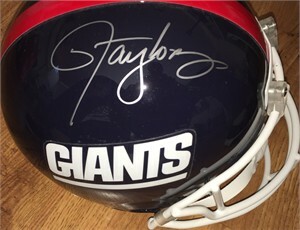 New York Giants Riddell full size replica throwback helmet autographed beautifully in silver paint by legendary Hall of Fame linebacker Lawrence Taylor. From a paid signing with Leaf Authentics, with their numbered hologram on the helmet and certificate of authenticity card. ONLY ONE AVAILABLE FOR SALE.